This is my seventh post about our adventure traveling through Maryland, Delaware, New Jersey, and Pennsylvania. 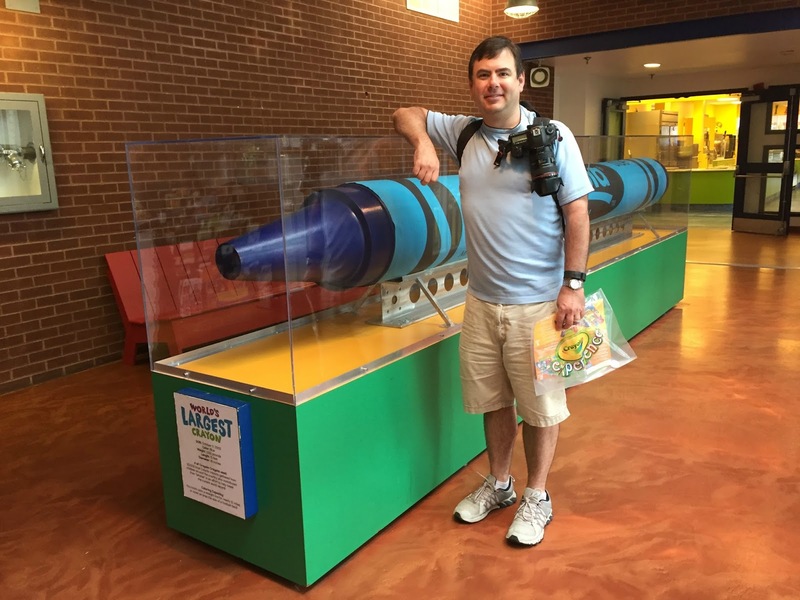 You can find the first post from this trip here and links to all the other educational US travel our family has done here. 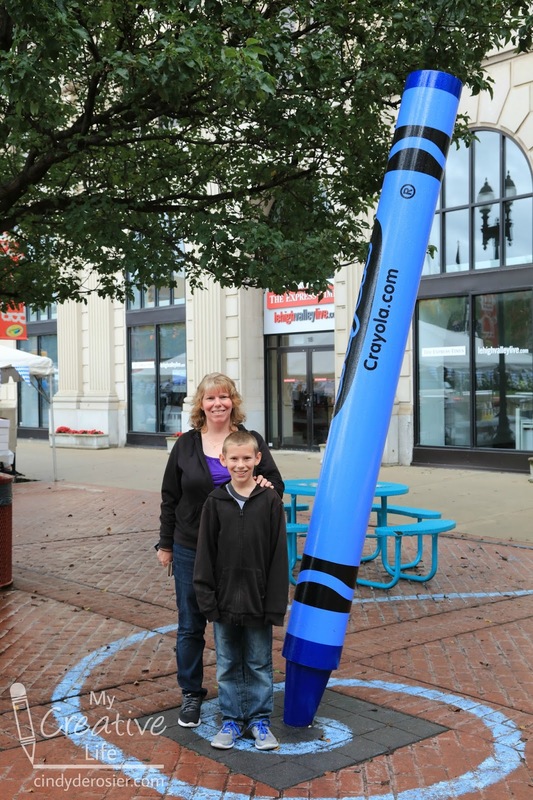 We simply could not pass up an opportunity to see the World's Largest Crayon, so we added a day in Easton, PA to our itinerary. The World's Largest Crayon is housed at Crayola Experience. I've been wanting to go there for years and when I realized we'd only be an hour away, I was so excited. And it did not disappoint. We loved it! I wonder what the neighbors would say if I put a statue just like this one in the front yard. 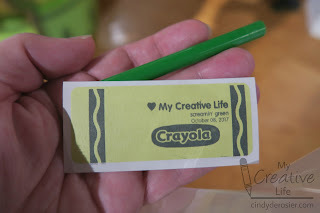 Because I totally would, except mine would be a trio of three crayons in our family colors. 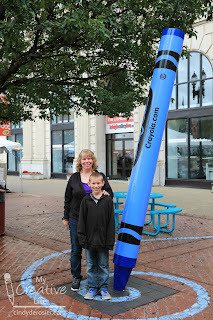 We got to Crayola Experience right at opening on a Sunday and there were a lot of people there already. So we used our time-honored technique of zipping up three flights of stairs to the 4th floor and working our way down in hopes that most people would be working their way up. Success! We had the 4th floor almost completely to ourselves. And what a great place to start! We painted pictures with melted crayons. We molded crayons into rings and car-shaped souvenirs to take home. 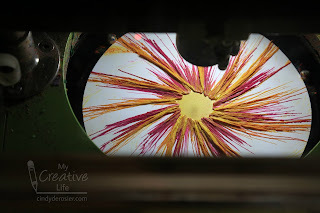 And we made beautiful spin art. 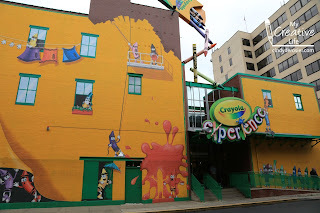 Those three activities are reason enough to go to Crayola Experience! It was so much fun. 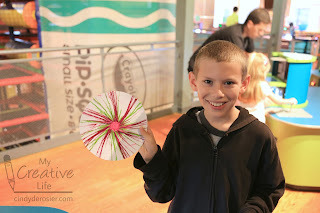 In the activity center, we played with watercolors, markers, and Twistables. At one station, we turned our artwork into a puzzle! 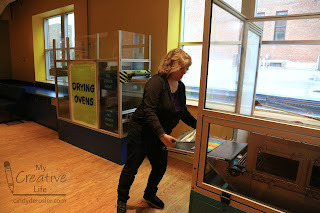 I totally need their drying ovens at home. They are a game-changer when it comes to wet media, like watercolors. Someday when I have the budget to commission a Crayola statue for my front yard, I'll have a drying oven installed at the same time. 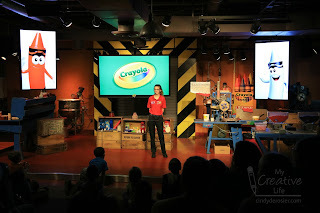 Next, we watched a live show about how crayons are made. It was geared toward young children, but full of interesting facts for older kids and adults as well. 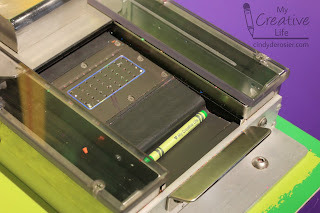 One of the (many) highlights of the day for me was designing and printing my own crayon wrapper and using a machine to apply it to a crayon. Best souvenir ever! 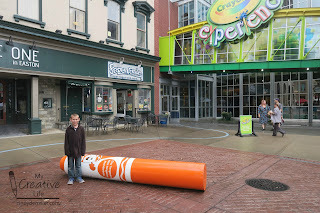 I should explain that when you pay admission to Crayola Experience, you are given two tokens. 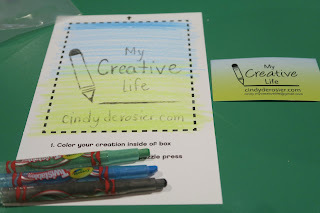 It costs a token to make your own crayon wrapper. 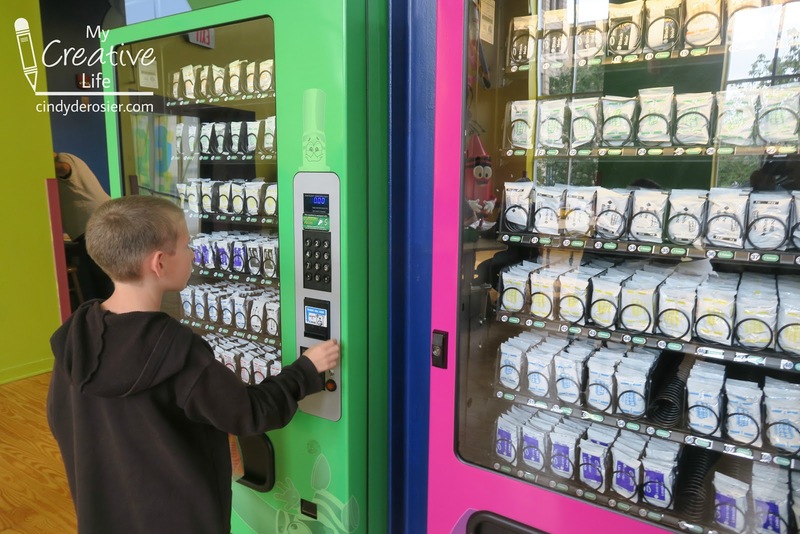 You can also spend your tokens to get Model Magic from the world's most awesome vending machine. Everything else is included with admission. 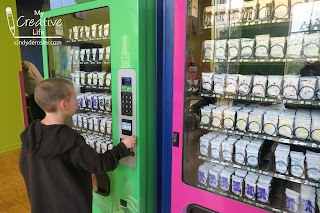 You can buy more tokens if you want to make extra crayons or take home extra Model Magic, but I love that you don't need to spend extra money to experience the activities. Technology plays a big role throughout Crayola Experience. It was awesome to see your drawings come to live on screens and paper creations dance on a stage. We also loved the room filled with challenging puzzles that you solved via tablet. The best part is that there is no waiting. 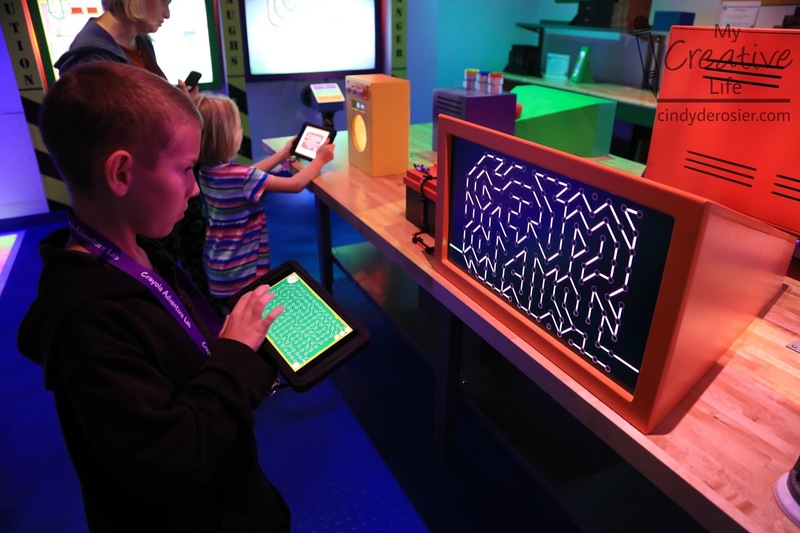 Your tablet automatically assigns you to a particular puzzle, so you can walk right up to it and work on it until it assigns your next puzzle! Brilliant! The gift shop at Crayola Experience is a dangerous place for art-lovers like Trevor and me. We did our best to control ourselves. It helped that we had almost no extra room in our luggage to bring home new stuff. 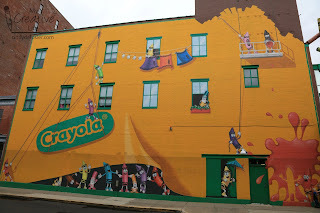 Check at the bottom of this post for links to some of our favorite Crayola products! 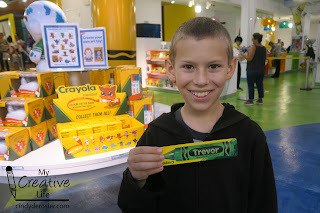 As a side note, we were surprised to find souvenirs personalized with Trevor's name not only at Crayola Experience, but at many other places we visited. That was not the case for the first ten years of his life. Trevor is not a very common name, which is exactly why we chose it. 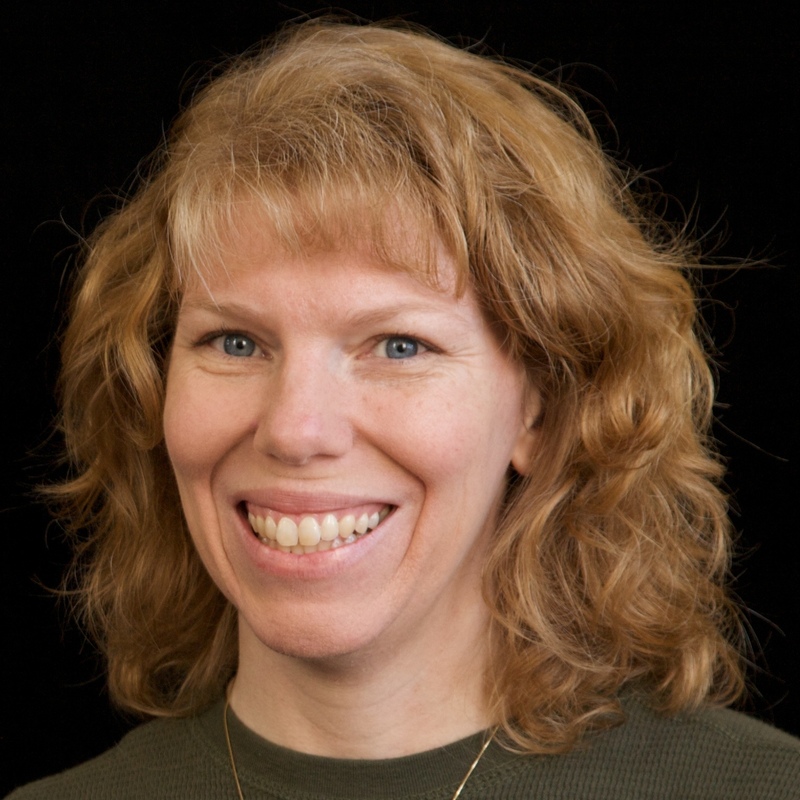 When he was born, it was ranked 125th amongst boys' names - common enough that people had heard of it and recognized it as a boy's name, but rare enough that he wouldn't find himself in a classroom with four Trevors. 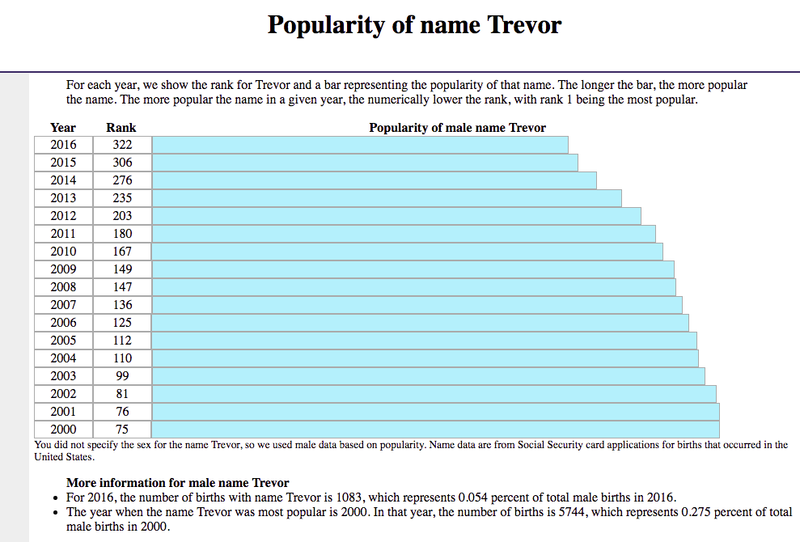 I haven't checked on the popularity of the name Trevor in years, so I popped over to the Social Security baby name page to see if it had suddenly become popular. Answer: No. It's actually been declining in popularity. 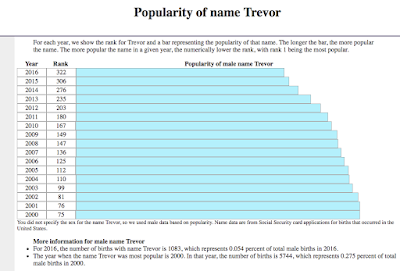 But when I went back a decade, I learned that the name Trevor peaked in popularity (ranked #58) in the mid-90's. So apparently now that those Trevors are adults, they're putting their name on souvenirs to make up for not being able to find them when they were kids. At least that's my best theory of why a name that isn't all that common is showing up in gift shops all of a sudden. 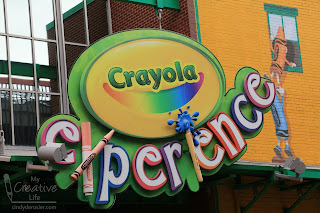 Anyway, we had a fantastic time at Crayola Experience. After we got our souvenirs, we took the back exit to head toward our car. The backside of the building is so incredibly cool. I might have to change the plans for a trio of crayons in our front yard to a sculpture of a box of crayons spilling out over our doorway. 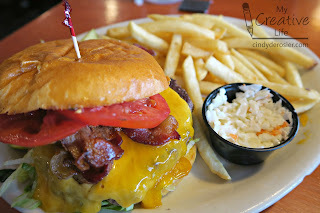 After all the fun crafting, it was time to eat. I'd run across reviews for Diner 248 during my Easton research. 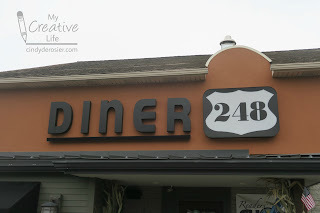 They describe their food as 'fine dinering' which cracked me up. And it was indeed fine dinering. The food was classic diner food, elevated. 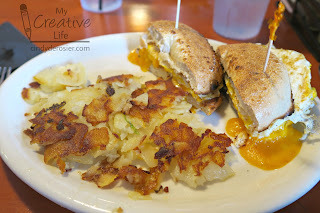 The decor likewise was much nicer than in a standard diner. 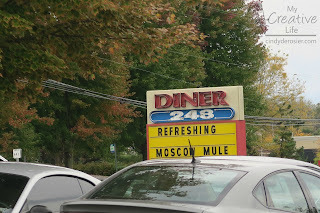 The prices were in line with what you'd expect at a diner. No wonder every spot in the parking lot was full! HOW AWESOME that place would be to visit!!! WOW WOW WOW!!!! LOVING all the photos!! 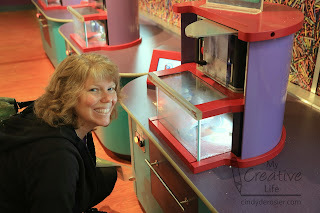 I would have needed an extra paycheck in their gift shop! LOL!!!! Believe it or not, BROOKE is also a hard name to find in souvenirs -- ADAM too!!! I really have a hard time finding their names!! And ironically - neither one of them have had a another BROOKE or ADAM in their entire schools -- not just their classes, but the whole school! HA!! !